"One Nation Indivisible" - Chapter Five: "And Justice For All"
The world is on the brink of war without resources, the Wonders who aren't trying to help society in its darkest hour are either trying to prevent conflict or are preparing for it. Many superhumans are questioning if they should do anything. Finally, it's Green Lantern who makes the biggest decision of all. Instead of using his power to enforce his will on the populace, he shares it. Alan Scott becomes human again as he removes his ring and places it in a machine. This gives New Earth 2 the energy it needs for its inhabitants to survive. This may not prevent all wars, but it did stop this one. However, another battle could be lurking around the corner as the Ultra-Humanite is hatching an insidious plot that may give him control of the entire world. Story - 5: There were moments I thought this chapter would copy Marvel's Civil War or its cinematic counterpart Captain America 3. I was sincerely prepared to give this story a lower rating. However, it did redeem itself in the end with Alan Scott's sacrificing his Green Lantern power to help New Earth 2. The epilogue with the Ultra-Humanite made me curious about the next issue. 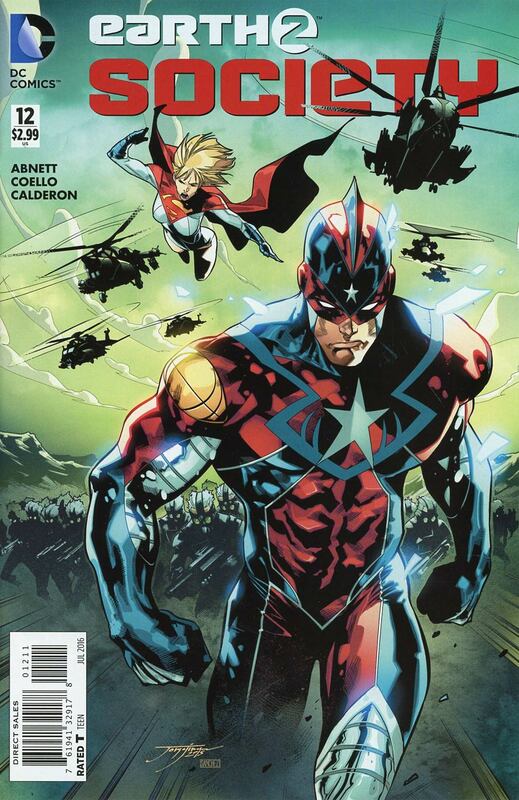 In the end of it all, Dan Abnett has written another great issue of this series. Keep 'em coming, Dan, and I'll keep reading 'em. Art - 4: Okay, the art is incredible, but my problem is the change in styles from one issue to another is jarring to a reader's eyes if they read the trade or the entire serial in single issue format. Having recently become an editor for a small press comic publisher, I understand that an artist must leave a title for one reason or other, but I like when one stays around for a story arc before moving on. This will help fans adjust to the change better in my opinion. Cover Art - 5: The image makes one wonder what's going on, and it keeps the buyer in suspense until they read the comic. It's beautifully rendered too. It's an amazing cover.